Content - ADJ Entour Faze: Introducing A New Faze! ADJ Entour Faze: Introducing A New Faze! ADJ’s large-format Entourage professional touring faze machine and Entour Venue installation model have proved extremely popular over the past couple of years, however we recognized that there was a need for a more compact and affordable version for installation in smaller venues and for use by mobile entertainers or small stages. If that’s something that you’ve been crying out for, we’re very pleased to be able to introduce you to the new Entour Faze. Based on the same principles as its bigger brothers in the Entour range, the Entour Faze is a hybrid between a traditional fog machine and a haze generator – hence the concept of ‘Faze’. The unit uses standard water-based fog fluid but dissipates it using a high-power fan to create an atmospheric haze-like effect instead of the thick plume of smoke associated with a regular fog machine. ADJ recommends the F4L ECO water-based fog fluid. It’s a lighter blend that’s optimal for the Entour Faze. 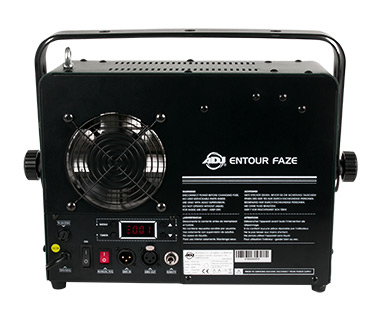 The Entour Faze is equipped with a 450W heater which utilizes ADJ’s new patent-pending rapid heating technology that allows the machine to be ready to produce haze in just 40 SECONDS! Although less powerful than the larger (and more expensive) Entour models, the Entour Faze still offers an impressive output that is more than capable of filling small-to-medium-sized venues with lightshow-enhancing haze. It’s output is 1000 cubic feet of haze per minute, while its fluid consumption rate is 10 ml. per minute, which means that it is capable of 5 hours of continuous output from a single (3-liter) tank of fluid. For added convenience, the unit is also fitted with a useful ‘quick connect’ hose which joins the machine to the fluid tank. This allows the tank to be disconnected simply, with the push of a button, allowing for quick and easy re-filling of fluid. An automatic cut-off circuit is also fitted that protects the pump if the tank runs out of fluid. With a robust metal construction and compact design, the Entour Faze is ideal for use in both fixed installations and on the road by production companies, bands, entertainers and mobile DJs. Its slim dimensions of 16.25” x 8” x 12” / 414 x 202 x 303mm (L x W x H) means that the unit is easily portable and will make an inconspicuous addition to any stage or dancefloor lighting rig. Meanwhile, weighing just 10 lbs. / 4.5 kg, the unit is also easy to carry and rig, making it ideal for enhancing the effects created by a mobile lightshow. It features a unique dual bracket that can be used to either hang the fixture from above or create a stand that allows it to be positioned directly on the floor or stage of a venue with its output directed at any desired angle. A safety eye is also provided to allow the attachment of a safety wire when the unit is rigged and it is fitted with rubber feet that allow it to operate standing directly on the floor without the use of the variable-angle bracket if preferred. As a flexible machine, the Entour Faze can be operated in a number of different ways to suit your personal preferences or the requirements of a particular application. For simple faze generation, it offers an on/off trigger switch on its back panel that can be used to engage the effect whenever it is required. It is also supplied with a wired remote control, which connects to the main unit via a ¼” jack plug and can be used to alter the density of the haze effect. Finally, the unit is also compatible with DMX control, with a choice of 1, 2 or 4-channel operation, allowing it to be controlled using any DMX control hardware or software. 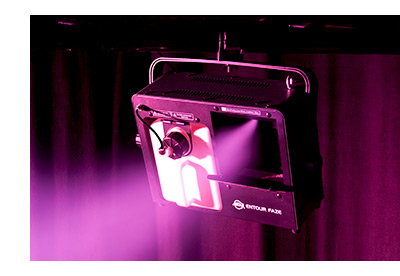 Via DMX, it is possible to independently alter both the fog output and fan speed in order to create exactly the right haze effect for a given venue and event. Combining a potent heating element with a powerful fan in a compact, robust and versatile fixture, the Entour Faze is ideal for enhancing the beams and effects of any lightshow. Whether you’re looking for a unit to install permanently – in a church, entertainment center, community theatre or nightclub – or need a portable haze generator to use for one-off parties or events, the Entour Faze is the affordable, reliable and flexible solution!